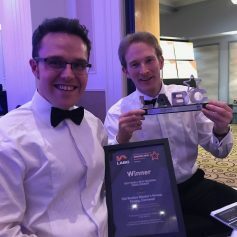 In April 2018 Atelier 3 were delighted to win the Best Small Residential Development Award for Old Station Masters House in Fowey as well as being a Finalist for another award. After setting up the practice in 2007, Atelier 3 has come a long way over the last ten years. We were therefore pleased to throw a party in December 2017 to thank all our clients, consultants and contractors for their support over the last decade. Atelier 3 together with Acorn Blue have won a UK Property Award at the December 2017 awards in the residential category for Old Station Masters House in Fowey. We have an exciting and growing project portfolio and are always interested in meeting talented people to join our team. In May 2017 Atelier 3 was shortlisted for a RICS Award for the Old Stations Masters House project in Fowey. The team went up to Bristol for the awards evening with client Acorn Blue. From retail (A1) or financial and professional services (A2) to residential (C3) with some associated physical works. Up to 150m2 can change use. From retail (A1) to banks, building societies, credit unions and friendly societies, but do not allow subsequent change to other A2 uses. From buildings in agricultural use to residential use (C3) with some associated physical works to enable conversion to take place. Up to 450m2 can change use on an agricultural unit to provide up to three homes. From offices, hotels, residential and non-residential institutions and leisure and assembly (B1, C1, C2, C2A and D2) to nurseries providing childcare. 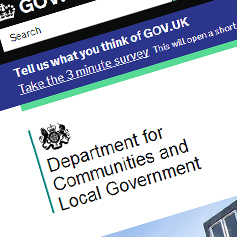 At the time of writing Cornwall Council interpretation of this new regulation is yet to be published however Atelier 3 are currently liaising with the local authority to seek clarification of what will be required for a prior notification application. For more information please contact Tim Hancock on 01208 895536 who can advise you further. Wondering what to do with that redundant farm building? 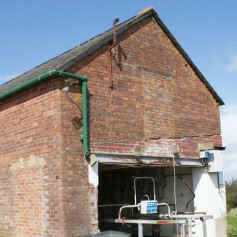 New regulations that came into use on 6th April 2014 mean that existing agricultural buildings can be converted into a variety of uses including residential without the need of a full planning application. The policy is designed to support rural communities by making better use of existing buildings and to help with the housing shortage. Want to find out more call Tim Hancock on 01208 895536. 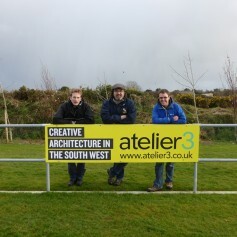 Atelier 3 are proud to have sponsored the match ball at the top of the league clash between Sticker AFC and Mousehole. Atelier 3 sponsored the match ball at the top of the league clash between Sticker AFC and Mousehole on Saturday 22nd March 2014. Sticker having won the match are now at the top of the South West Peninsula Football League. Tim is a committee member of the club. 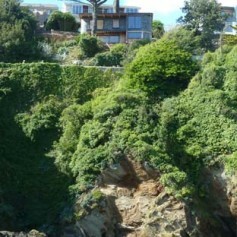 Wow, not one but two Atelier 3 Projects have been shortlisted for the Cornwall Sustainability Awards. Wow, not one but two Atelier 3 Projects have been short-listed for the Cornwall Sustainability Awards. 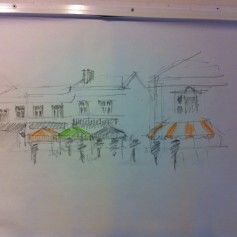 At the Big Draw Event Tim sketched his ideas of how areas of Liskeard could be regenerated with pop up markets and helped members of the public with translating their own ideas on to paper. The sketches have formed part of a Public exhibition at The Stuart House in Liskeard and are part of the ongoing community consultation on the future of Liskeard. Pollys Leap has been shortlisted by the editors of Build It magazine for the Best Home Award 2013. Read about it here! Pollys Leap featured in the April 2013 edition of the Build It Magazine. Atelier 3 are proud to be informed that Pollys Leap has been chosen by the editors of the magazine for the highly acclaimed ‘Best Home Award 2013’. 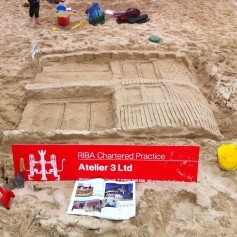 It's not all work - we had time one Sunday to build a project related sandcastle on a beach in St Ives. Organised by the Cornwall Branch of the RIBA and judged by the Town Mayor, this friendly competition is held at a different beach every year in the summer. Practices from the Region were set the task of producing a sandcastle replicating one of their individual projects – this was our attempt. Treyew Road site visit in October 2013. 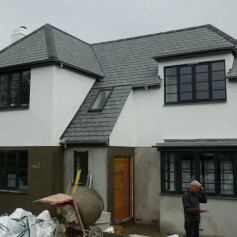 The final rendering and decoration is now underway.